Indoor water fountains are becoming increasingly popular. There are many reasons why people choose to purchase these fountains. For some, they act like a decorative accessory, adding a unique touch of beauty to their indoor space. For other people, the sound of the water running through the fountain promotes relaxation, making their homes a retreat where they can escape from the stress of the outside world. Fountains of all sizes can provide countless benefits for homeowners. If you are like most people, you probably are on the go from the time you go out of bed in the morning until the time you go to sleep at night. Stress levels are at an all-time high for the vast majority of people. Imagine how nice it would be to sit down next to your fountain after a stressful day and close your eyes, listening to the gentle sound of the water running through the fountain. Recent studies have proven what most people have known for a long time - that the sound of water promotes relaxation. If you want to create a more relaxing space, one of the easiest ways to do it is by adding an indoor water fountain to your home. According to Soothing Walls, indoor water fountains usually feature beautiful designs that can enhance the look and feel of your home. 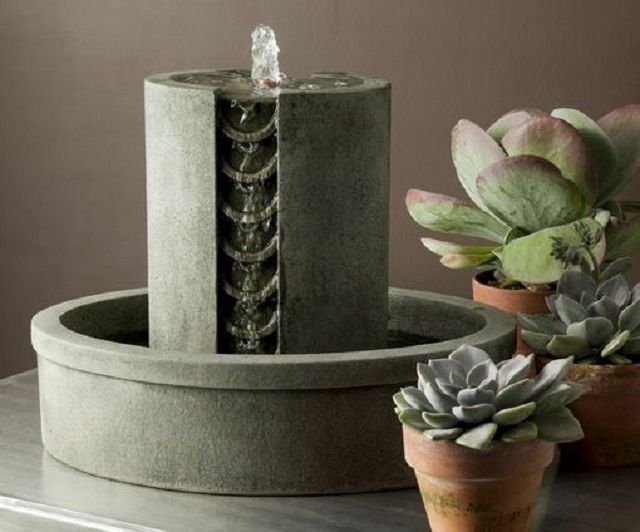 From a decorating standpoint, few other accessories provide the same visual impact as a beautifully designed fountain. You can even find fountains that incorporate unique elements such as LED lights. These features can help your fountain stand out even more. To create a natural setting for the fountain, consider surrounding it with houseplants. It is hard to relax when you are surrounded by unwanted noises. From traffic going by on the street outside to dogs barking in the neighboring yards, you may be bombarded by noises from every direction. One of the best ways to combat this problem is by installing an indoor water fountain. The sound of the water can help block out noises, creating a much more peaceful setting. If dry air is a problem where you live, an indoor water fountain can help. Fountains act as natural humidifiers, adding moisture back into the surrounding air. This can not only benefit your skin, hair, and respiratory health but can also help keep your houseplants healthy. It’s one of the big reasons many add an indoor water feature to their homes. Typically, when people hear someone mention air pollution, they picture giant smokestacks spewing contaminants into the air or cars leaving trails of exhaust as they drive down the road. In fact, however, the air inside your home may be even more contaminated than the air outdoors. Inadequate ventilation and contaminants in the air can lead to poor indoor air quality. Installing an indoor water fountain can help reduce this problem. As the water in the fountain moves, it releases negative ions. These ions can help trap and remove airborne contaminants. Indoor water fountains provide numerous benefits. When you consider all of the ways that they can help you live a healthier, more peaceful life, you will most likely want to get one for your own home. Not only are they beautiful to look at but they are also a practical investment for your peace of mind and well-being. Image via At Home With White Pinterest. Yes, I like outdoor water fountain especially in my garden. An indoor fountain would be so relaxing!